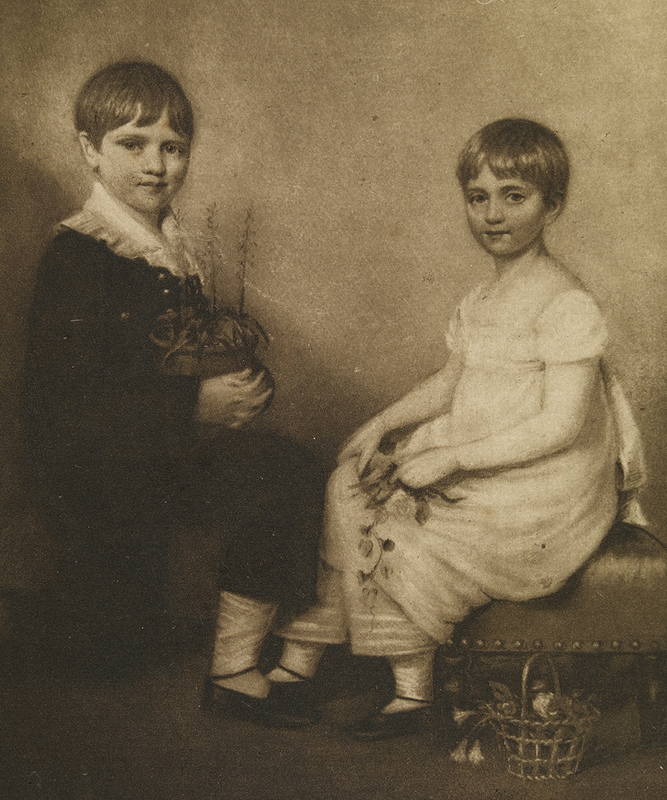 On his engagement to his cousin, Emma Wedgwood, in 1838, Darwin wrote down his recollections of his early childhood. 1813 summer.–– When I was four year & a half old went the sea & staid there some weeks–– I remember many things, but with the exception of the maid servants (& these are not individualised) I recollect none of my family, who were there.–– I remember either myself or Catherine being naughty, & being shut up in a room & trying to break the windows.–– I have obscure picture of house before my eyes, & of a neighbouring small shop, where the owner gave me one fig, but which to my great joy turned out to be two:––this fig was given me that this man might kiss the maidservant:–– I remember a common walk to a kind of well, on the road to which was a cottage shaded with damascene trees, inhabited by old man, called a hermit, with white hair, used to give us damascenes–– I know not whether the damascenes, or the reverence & indistinct fear for this old man produced the greatest effect, on my memory.–– I remember, when going there crossing in the carriage a broad ford, & fear & astonishment of white foaming water has made vivid impression.–– I think memory of events commences abruptly, that is I remember these earliest things quite as clearly as others very much later in life, which were equally impressed on me.–– Some very early recollections are connected with fear, at Parkfields  with poor Betty Harvey I remember with horror her story of people being pushed into the canal by the towing rope, by going wrong side of the horse..–– I had greatest horror of this story.––keen instinct against death.–– Some other recollections are those of vanity, & what is odder a consciousness, as if instinctive, & contempt of myself that I was vain––namely thinking that people were admiring me in one instance for perseverance & another for boldness in climbing a low tree.–– My supposed admirer was old Peter Hailes the bricklayer, & the tree the Mountain Ash on the lawn. When I was 9 & ½ years old (July 1818) I went with Erasmus to see Liverpool.–– it has left no impression in my mind, except most trifling ones.––fear of the coach upsetting, a good dinner, & an extremely vague memory of ships. The home of Sarah Wedgwood, the wife of Josiah Wedgwood I, and CD’s grandmother. After Sarah’s death in 1815, it remained the residence of Catherine (Kitty) and Sarah Elizabeth (Sarah) Wedgwood, CD’s aunts. The intended position of the passages ‘She remembers . . . her––’ and ‘& so with very many other cases’ is not entirely clear. The comment ‘& so with very many other cases’ is interlined in the main text and preceded by an asterisk, a device frequently used by CD to refer to an extra section of text to be interpolated. In this case the asterisk probably refers to the section ‘She remembers . . . her––’, which, although having no corresponding mark, is a later addition to the verso of the folio and evidently meant to be inserted at some point in the main text. The interlined ‘& so with very many other cases’ actually follows ‘yet she . . . day,’ (3.3––4) in the manuscript, but the passage has been transcribed in the order that appears most meaningful. The paragraph ‘Susan . . . . forgotten.––’ is on the verso of the folio. It has been transcribed in the position in the text that seems most appropriate. The paragraph ‘I remember . . . House.—’ is on the verso of the folio; both it and its point of intended insertion in the main text are marked ‘(a)’. This transcription of Darwin's 'autobiographical fragment' is adapted from The correspondence of Charles Darwin, vol. 2, Appendix III.